In this assignment you will implement a simple rasterizer, including features like supersampling, hierarchical transforms, and texture mapping with antialiasing. At the end, you'll have a functional vector graphics renderer that can take in modified SVG (Scalable Vector Graphics) files, which are widely used on the internet. Project 1 is due Tuesday, February 12th at 11:59pm. Both your code and write-up need to be turned in for your submission to be complete; assignments which are turned in after 11:59pm are a full day late -- there are no late minutes or late hours. First, accept the assignment in your CS184 website profile, following the instructions from GitHub Classroom. Then, clone the generated repo. Make sure you clone your repo, and not the class skeleton. Also ensure GitHub Pages is enabled for your assignment. Please consult this article for more information on how to build and submit assignments for CS 184. As you go through the assignment, refer to the write-up guidelines and deliverables section below. It is recommended that you accumulate deliverables into sections in your webpage write-up as you work through the project. You may find it helpful to skim this section before beginning your work. Note: Do not squander all your hard work on this assignment by converting your png files into jpg or any other format! Leave the screenshots as they are saved by the 'S' key in the GUI, otherwise you will introduce artifacts that will ruin your rasterization efforts. Finally, you may find the following resources helpful: C++ Guide for some quick tips and tricks on getting started with C++. A slightly more detailed C++ guide can be found here. Images as Data on how images and colors are often represented in code. If you load a directory with up to 9 files, you can switch between them using the number keys 1-9 on your keyboard. The project has 7 parts, divided into 3 sections, worth a total of 100 possible points. Some require only a few lines of code, while others are more substantial. Part 7: Draw something interesting! There is a fair amount of code in the CGL library, which we will be using for future assignments. The relevant header files for this assignment are vector2D.h, matrix3x3.h, color.h, and renderer.h. Here is a very brief sketch of what happens when you launch draw: An SVGParser (in svgparser. *) reads in the input svg file(s), launches a OpenGL Viewer containing a DrawRend renderer, which enters an infinite loop and waits for input from the mouse and keyboard. DrawRend (drawrend. *) contains various callback functions hooked up to these events, but its main job happens inside the DrawRend::redraw() function. The high-level drawing work is done by the various SVGElement child classes (svg. *), which then pass their low-level point, line, and triangle rasterization data back to the three DrawRend rasterization functions. In addition to modifying these, you will need to reference some of the other source and header files as you work through the project. Triangle rasterization is a core function in the graphics pipeline to convert input triangles into framebuffer pixel values. In Part 1, you will implement basic triangle rasterization. You may first want to read this resource on how colors and images are represented as data. First, fill in the SampleBuffer::fill_color() function in drawrend.h, which sets the color of a single sub-pixel sample. Each SampleBuffer instance represents a single pixel, and holds the many sub-pixel samples for this individual pixel in std::vector<std::vector<PixelColorStorage>> sub_pixels. A PixelColorStorage is defined in drawrend.h as a vector of unsigned char, which you can think of as an array of [r,g,b] format. Thus, the SampleBuffer isa 2D array of [r,g,b]s.
Sub-pixel sampling will be useful in Part 2, but in this step you should only sample once per pixel by calling SampleBuffer::fill_pixel() after you finishSampleBuffer::fill_color(). Next, fill in the DrawRend::rasterize_triangle(...) function in drawrend.cpp using the methods discussed in lecture 2. PixelColorStorage stores each r, g, and b channel as uint8 from 0 to 255, while Color stores them as floats from 0.0 to 1.0. Pay attention to the different data types. Remember to do point-in-triangle tests with the point exactly at the center of the pixel, not the corner. Your coordinates should be equal to some integer point plus (.5,.5). You should not make any assumptions about the ordering of the given points (i.e. whether or not they are given in clockwise order). Check svg/basic/test6.svg. For now, ignore the Triangle *tri input argument to the function. We will come back to this in Part 4. You are encouraged but not required to implement the edge rules for samples lying exactly on an edge. Make sure the performance of your algorithm is no worse than one that checks each sample within the bounding box of the triangle. When finished, you should be able to render many more test files, including those with rectangles and polygons, since we have provided the code to break these up into triangles for you. In particular, basic/test3.svg, basic/test4.svg, basic/test5.svg, and basic/test6.svg should all render correctly. Extra Credit: Make your triangle rasterizer super fast (e.g., by factoring redundant arithmetic operations out of loops, minimizing memory access, and not checking every sample in the bounding box). Write about the optimizations you used. Use clock() to get timing comparisons between your naive and speedy implementations. Use supersampling to antialias your triangles. The sample_rate parameter in DrawRend (adjusted using the - and = keys) tells you how many samples to use per pixel. The image below shows how sampling four times per pixel produces a better result than just sampling once, since some of the supersampled pixels are partially covered and will yield a smoother edge. To do supersampling, each pixel is now divided into sqrt(sample_rate) * sqrt(sample_rate) sub-pixels. In other words, you still need to keep track of height * width pixels, but now each pixel has sqrt(sample_rate) * sqrt(sample_rate) sampled colors. You will need to do point-in-triangle tests at the center of each of these sub-pixel squares. Unlike in Part 1, you will use the provided SampleBuffer class to store each sub-pixel sample by calling SampleBuffer::fill_color() directly instead of SampleBuffer::fill_pixel(). You will also need to update SampleBuffer::get_pixel_color() to average all of the sub-pixel samples to compute the final output color of that pixel (instead of simply discarding all but one sub-pixel's sample data). Your implementation will be called by DrawRend::resolve() in during the final rasterization steps. Your triangle edges should be noticeably smoother when using > 1 sample per pixel! You can examine the differences closely using the pixel inspector (see controls listed above). Also note that, it may take several seconds to switch to a higher sampling rate. Extra Credit: Implement an alternative sampling pattern, such as jittered or low-discrepancy sampling. Create comparison images showing the differences between grid supersampling and your new pattern. Try making a scene that contains aliasing artifacts when rendered using grid supersampling but not when using your pattern. You can also try to implement more efficient storage types for supersampled framebuffers, instead of using one samplebuffer per pixel. Implement the three transforms in the transforms.cpp file according to the SVG spec. The matrices are 3x3 because they operate in homogeneous coordinates -- you can see how they will be used on instances of Vector2D by looking at the way the * operator is overloaded in the same file. Extra Credit: Add an extra feature to the GUI. For example, you could make two unused keys to rotate the viewport. Save an example image to demonstrate your feature, and write about how you modified the SVG to NDC and NDC to screen-space matrix stack to implement it. Familiarize yourself with the ColorTri struct in svg.h. Modify your implementation of DrawRend::rasterize_triangle(...) so that if a non-NULL Triangle *tri pointer is passed in, it computes barycentric coordinates of each sample hit and passes them to tri->color(...) to request the appropriate color. Note that the barycentric coordinates are stored with type Vector3D, so you should use p_bary[i] to store the barycentric coordinate corresponding to triangle vertex PiP_iP​i​​ for i=0,1,2i=0,1,2i=0,1,2. Implement the ColorTri::color(...) function in svg.cpp so that it interpolates the color at the point p_bary. This function is very simple: it does not need to make use of p_dx_bary or p_dy_bary, which are for texture mapping. Note that this color() function plays the role of a very primitive shader. Once Part 4 is done, you should be able to see a color wheel in svg/basic/test7.svg. Familiarize yourself with the TexTri struct in svg.h. This is the primitive that implements texture mapping. For each vertex, you are given corresponding uv coordinates that index into the Texture pointed to by *tex. To implement texture mapping, DrawRend::rasterize_triangle should fill in the psm and lsm members of a SampleParams struct and pass it to tri->color(...). Then TexTri::color(...) should fill in the correct uv coordinates in the SampleParams struct, and pass it on to tex->sample(...). Then Texture::sample(...) should examine the SampleParams to determine the correct sampling scheme. The GUI toggles DrawRend's PixelSampleMethod variable psm using the 'P' key. When psm == P_NEAREST, you should use nearest-pixel sampling, and when psm == P_LINEAR, you should use bilinear sampling. For this part, just pass 0 for the level parameter of the sample_nearest and sample_bilinear functions. Once Part 5 is done, you should be able to rasterize the svg files in svg/texmap/, which rely on texture maps. Finally, add support for sampling different MipMap levels. The GUI toggles DrawRend's LevelSampleMethod variable lsm using the 'L' key. When lsm == L_ZERO, you should sample from the zero-th MipMap, as in Part 5. When lsm == L_NEAREST, you should compute the nearest appropriate MipMap level using the one-pixel difference vectors du and dv and pass that level as a parameter to the nearest or bilinear sample function. When lsm == L_LINEAR, you shoould find the appropriate MipMap level. Then compute a weighted sum of using one sample from each of the adjacent MipMap levels. scale up those difference vectors respectively by the width and height of the full-resolution texture image. With these, you can proceed with the calculation from the lecture slides. The lsm and psm variables can be set independently and interact independently. In other words, all combinations of psm==[P_NEAREST, P_LINEAR] x lsm==[L_ZERO, L_NEAREST, L_LINEAR] are valid. As a point of interest, when lsm == L_LINEAR and psm == P_LINEAR, this is known as trilinear sampling. Extra Credit: Implement anisotropic filtering or summed area tables. Show comparisons of your method to nearest, bilinear, and trilinear sampling. Use clock() to measure the relative performance of the methods. Use your newfound powers to render something fun. You can look up the svg specifications online for matrix transforms and for Point, Line, Polyline, Rect, Polygon, and Group classes. The ColorTri and TexTri are our own inventions, so you can intuit their parameters by looking at the svgparser.cpp file. You can either try to draw something "by hand" or try to output an interesting pattern programmatically. For example, we wrote some simple programs to generate the texture mapped svg files in the texmap directory as well as the color wheel in basic/test7.svg. Flex your right or left brain -- either show us your artistic side, or generate awesome procedural patterns with code. This could involve a lot of programming either inside or outside of the codebase! If you write a script to generate procedural svg files, include it in your submission and briefly explain how it works. Your resulting png screenshot should be 800x800 resolution. Keep this in mind when writing your svg file. Use the GUI's 'S' functionality to save your screenshot as a png. Don't take your own screenshot of your rasterized result, or you'll ruin the quality of your hard work! Note: The rasterizer cannot display svg Path elements, so do not include any curves in the svg you wish to load. Students will vote on their favorite submissions and the top voted submission(s) will receive extra credit! More details regarding the art competition will be announced next week. Stay in tune! Please consult this article on how to build and submit assignments for CS 184. You will submit your code as well as some deliverables (see below) in a webpage project write-up. We have provided a simple HTML skeleton in index.html found within the docs directory to help you get started and structure your write-up. You are also welcome to create your own webpage report from scratch using your own preferred frameworks or tools. However, please follow the same overall structure as described in the deliverables section below. An overview of the project, your approach to and implementation for each of the parts, and what problems you encountered and how you solved them. Strive for clarity and succinctness. On each part, make sure to include the results described in the corresponding Deliverables section in addition to your explanation. If you failed to generate any results correctly, provide a brief explanation of why. The final (optional) part for the art competition is where you have the opportunity to be creative and individual, so be sure to provide a good description of what you were going for and how you implemented it. Clearly indicate any extra credit items you completed, and provide a thorough explanation and illustration for each of them. The write-up is one of our main methods of evaluating your work, so it is important to spend the time to do it correctly and thoroughly. Plan ahead to allocate time for the write-up well before the deadline. Note that this rubric is rather coarse. The content and quality of your write-up are extremely important, and you should make sure to at least address all the points listed below. The extra credit portions are intended for students who want to challenge themselves and explore methods beyond the fundamentals, and are not worth a large amount of points. In other words, don't necessarily expect to use the extra credit points on these projects to make up for lost points elsewhere. Give a high-level overview of what you implemented in this project. Think about what you've built as a whole. Share your thoughts on what interesting things you've learned from completing the project. 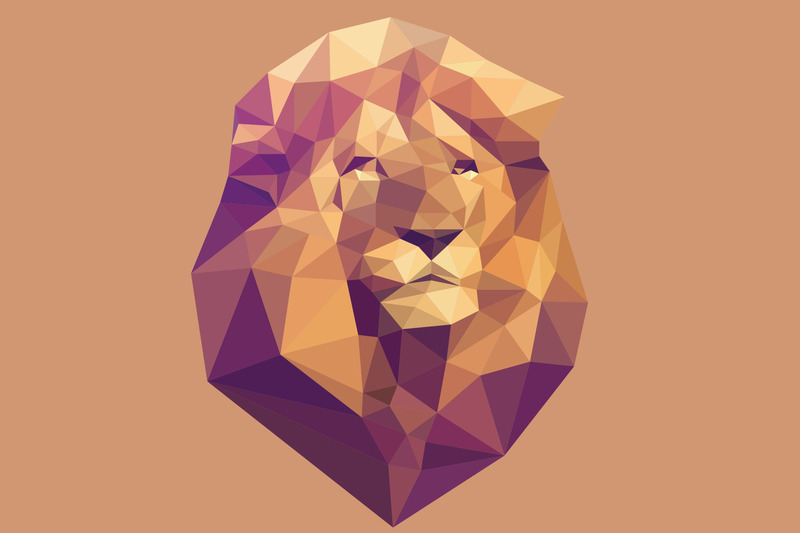 Walk through how you rasterize triangles in your own words. 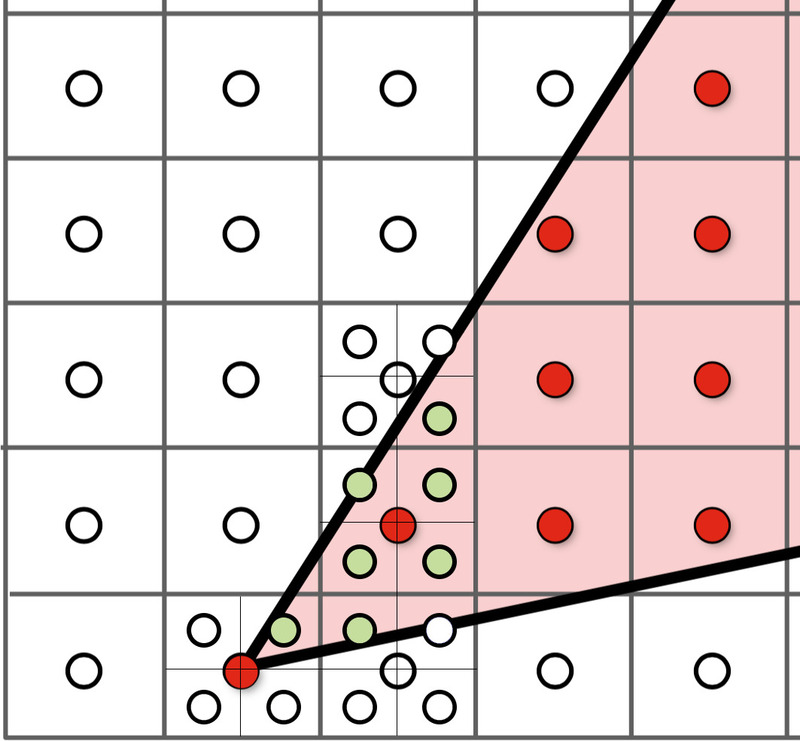 Explain how your algorithm is no worse than one that checks each sample within the bounding box of the triangle. Show a png screenshot of basic/test4.svg with the default viewing parameters and with the pixel inspector centered on an interesting part of the scene. Extra credit: Explain any special optimizations you did beyond simple bounding box triangle rasterization, with a timing comparison table (we suggest using the c++ clock() function around the svg.draw() command in DrawRend::redraw() to compare millisecond timings with your various optimizations off and on). Walk through how you implemented supersampling. Why is supersampling useful? What modifications did you make to the rasterization pipeline in the process? Explain how you used supersampling to antialias your triangles. Show png screenshots of basic/test4.svg with the default viewing parameters and sample rates 1, 4, and 16 to compare them side-by-side. Position the pixel inspector over an area that showcases the effect dramatically; for example, a very skinny triangle corner. Explain why these results are observed. Extra credit: If you implemented alternative antialiasing methods, describe them and include comparison pictures demonstrating the difference between your method and grid-based supersampling. 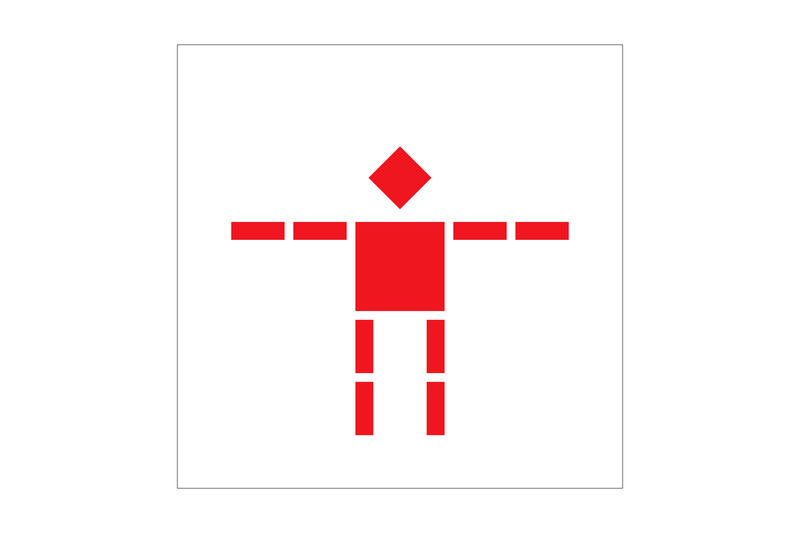 Create an updated version of svg/transforms/robot.svg with cubeman doing something more interesting, like waving or running. Feel free to change his colors or proportions to suit your creativity. Save your svg file as my_robot.svg in your docs/ directory and show a png screenshot of your rendered drawing in your write-up. Explain what you were trying to do with cubeman in words. Explain barycentric coordinates in your own words and use an image to aid you in your explanation. One idea is to use a svg file that plots a single triangle with one red, one green, and one blue vertex, which should produce a smoothly blended color triangle. Show a png screenshot of svg/basic/test7.svg with default viewing parameters and sample rate 1. If you make any additional images with color gradients, include them. Explain pixel sampling in your own words and describe how you implemented it to perform texture mapping. Briefly discuss the two different pixel sampling methods, nearest and bilinear. Check out the svg files in the svg/texmap/ directory. Use the pixel inspector to find a good example of where bilinear sampling clearly defeats nearest sampling. Show and compare four png screenshots using nearest sampling at 1 sample per pixel, nearest sampling at 16 samples per pixel, bilinear sampling at 1 sample per pixel, and bilinear sampling at 16 samples per pixel. Comment on the relative differences. Discuss when there will be a large difference between the two methods and why. Explain level sampling in your own words and describe how you implemented it for texture mapping. You can now adjust choosing between pixel sampling and level sampling as well as adjust the number of samples per pixel. Analyze the tradeoffs between speed, memory usage, and antialiasing power between the various techniques at different zoom levels. Show at least one example (using a png file you find yourself) comparing all four combinations of one of L_ZERO and L_NEAREST with one of P_NEAREST and P_LINEAR at a zoomed out viewpoint. To use your own png, make a copy of one of the existing svg files in svg/texmap/ (or create your own modelled after one of the provided svg files). Then, near the top of the file, change the texture filename to point to your own png. From there, you can run ./draw and pass in that svg file to render it and then save a screenshot of your results. Extra credit: If you implemented any extra filtering methods, describe them and show comparisons between your results with the other above methods. Save your best svg file as competition.svg in your docs/ directory, and show us a 800x800 png screenshot of it in your write-up! Explain how you did it. If you wrote a script to generate procedural svg files, include it in your submission in the src/ directory and briefly explain how it works. Your main report page should be called index.html. Be sure to include and turn in all of the other files (such as images) that are linked in your report! Use only relative paths to files, such as "./images/image.jpg"
Do NOT use absolute paths, such as "/Users/student/Desktop/image.jpg"
Be sure to adjust the permissions on your files so that they are world readable. For more information on this please see this tutorial. Start assembling your webpage early to make sure you have a handle on how to edit the HTML code to insert images and format sections.